NERCOMP is accepting proposals for its 2015 conference from now until Oct 17. The 2015 NERCOMP Annual Conference knows we're "In IT Together," so submit a proposal to showcase solutions and strategies. At one of the afternoon breakout sessions during the Learning With MOOCs conference today, Jeff Merriman, Brandon Muramatsu and Cole Shaw spoke on ‘Tools to Enable the Design and Reuse of MOOC Materials’. Cathy Casserly, who works with open learning opportunities and knowledge sharing at the Hewlett Foundation, delivered the afternoon keynote at the LWMOOC conference at MIT today. DeGraff & Ruggles: "A Creole Solution"
What kinds of decisions does an expert make? 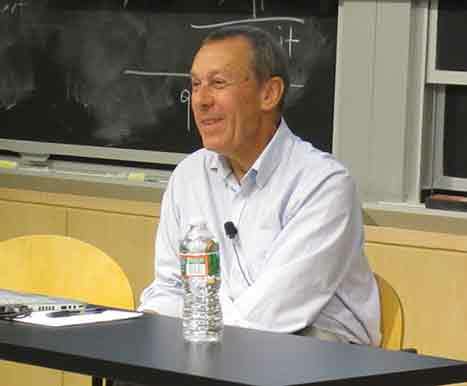 Earlier this month, Prof Tom Kochan delivered a provocative and absorbing xTalk on the changing expectations of the American Dream and how it affects work, education, and social mobility. At Thursday's joint xTalk/HHMI Education Group, Dr Sanjoy Mahajan led a lively exploration of different approaches to teaching and the impact of those approaches on long term learning and retention. We're excited to share our spring schedule of xTalks. We have an exciting roster of events. Some sessions explore education’s impact in broader social contexts; some focus on pedagogy.